We've been working flat out this season on designing the fastest possible products. Our new EC-130E Aero Road Bike has already taken the market by storm, with blistering performance and delivery in a couple of days why would you go anywhere else? Of course, not everyone has their focus on the road so we've been working hard on our track products as well. One design that crosses over and is available in both road and track variants is our new full-carbon 5-spoke aero road and track front wheels. Designed in the wind tunnel these wheels are both slippery fast, delivering benefits in terms of reduced drag and weight over standard deep section aero wheels. Spinning on low-friction, hybrid ceramic cartridge bearings both the track and road versions spin up to speed incredibly quickly and will help you leave the competition trailing in your wake. The road version uses a standard QR while the track version uses a bolt through Allen key skewer with safety tab. When we say light we really do mean it, the track version weighs in at just 585g, not bad for a full carbon, 5-spoke aero front wheel! Now you've found the next front wheel for your new track bike you'll be needing the rest of the bike! Our design team have been slaving away on their computers and making regular trips to the wind tunnel to test the results of their work and we really couldn't be any happier. The new Koichi San 2 Aero builds upon the great success we've already had on the track with this frame. We've created a faster, stiffer, stronger frameset that offers pinpoint steering and helps deliver every last watt to the back tyre. The aim was always for it to be the bike of choice for our team riders who are hunting for an Olympic track spot this season and frankly we've smashed that goal. Not only is the geometry right on the money but in wind tunnel tests performed at the National Wind Tunnel facility the Koichi San 2 was shown to be 11.3% more efficient than the Cervelo T4 at 30mph. That's a huge chunk of change, close to an additional 8 watts. When victories are measured in 1/100s of a second can you afford not to be competing on the new Koichi San 2 Aero? Now you've got your new track bike you'll need some way to get it to the Velodrome, you could either fork out half the price of your bike for a bike box or you could grab one of our new Super Deluxe Bike Bags. Fully padded from tip to tail and kitted out with a pair of fully padded wheel bags the Super Deluxe is ready to roll. 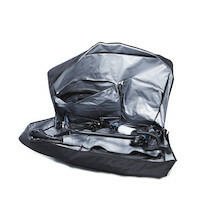 We've fitted two huge internal pockets so you can store all your tools and spares and there's a pair of large roller wheels on the back of the bag so you can scoot it around with you wherever you go. Weighing in around 5kg it's a whole load lighter than a bike box and it's perfect for shorts trips away and international hops. match the features against the competition. What do you get when you take our best selling Gravel Road Adventure bike and kit it out with a selection of bargain price commuter components, you get the Bish Bash Dosh of course? £999.99 of full carbon goodness, A bike for all seasons and all reasons. it's a fast, agile practical commuter bike that with a quick swap of tyres becomes a remarkably capable off-roader that's perfect for carrying you on any adventure. Make no mistake, the Bish Bash Bosh is a workhorse by nature and is ready and waiting to accompany you on life's little (or big) adventures. Be it off-road or on, the Bish Bash Bosh is a versatile beast covering a multitude of duties a ride anywhere bike, that will replace several other bikes in your stable and take the crown as your firm favourite. We've taken our Deluxe Bike Bag and made it Super. With full-length padding, internal wheel pockets the Super Deluxe Bike Bag is the perfect travel companion.